Kinship and friendship linked the Moses, Solomons, and Alexander families. Ties between Rebecca Isaiah Moses and Eleanor Israel Solomons date to their girlhood when Rebecca was growing up in Charleston and Eleanor was in Georgetown. Eleanor Solomons’s great-uncle Israel Joseph was president of Beth Elohim at the same time Abraham Alexander, Sr., was the congregation’s religious leader. In 1815, Eleanor’s husband Israel Solomons went into partnership with Abraham Alexander, Jr., a Charleston hardware merchant, who had married Eleanor’s Aunt Hannah Aarons. Generations of Solomons and Moseses married one another, creating a family tree only a diehard genealogist would tackle. Like other white families in the American South, Jewish families often were as intricately braided as a Sabbath bread. Photographs of L. J. Moses and his wife Adeline appear in the watch fob or locket that belonged to their son, Judah Touro Moses, whose initials are engraved on the case. Judah Touro was named for the famous philanthropist, first of Boston, then New Orleans, who was a distant family connection. 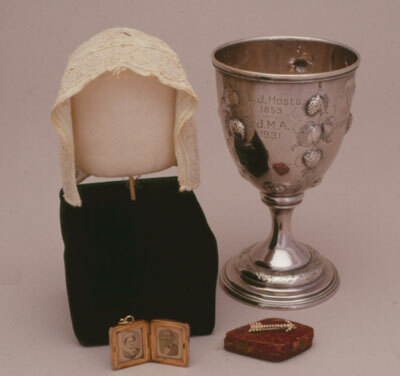 White on white with needle lace, the baby cap was made by Cecilia Moses Solomons for her sister Sarah Moses Alexander’s children and repaired by her daughter Rebecca Ella Solomons Alexander. In a letter L. J. Moses wrote from New York on August 20, 1866, he reports to his mother, Rebecca Moses, that he had been given a silver pitcher by the Hebrew Orphan Society, “in appreciation of my services and care taken of the funds thru the war. . . . Now if you will come here,” Levy writes, “I will use it in honor of yourself and you shall have a silver goblet to drink out of.” The 1855 goblet shown here likely is the chalice to which he refers. Rebecca Moses wore this pearl arrow pin to fasten her lace collar in the 1843 portrait by C. W. Uhl pictured earlier. Passed down in the family, the pin appears again in a 20th-century painting of Rebecca’s granddaughter—young Israel Solomons’s sister—Rebecca Ella Solomons Alexander.